édité le 06/04/2018 - Plus de news de "Socar" - Voir la fiche entreprise de "Socar"
On March 30, SOCAR President Rovnag Abdullayev visited Petkim petrochemical complex and STAR Refinery to oversee the implementation of the projects in Aliaga, Turkey . The SOCAR Turkey Aegean Refinery (STAR) will be launched in September 2018. The senior executives held a meeting at the general office of the SOCAR’s branch companies in Aliaga to evaluate the current state of the company’s assets in Turkey and discuss future plans. It was noted that the vast majority of over $48 million was saved last year as a result of the optimization of Petkim production processes and supply chain. Petkim came under SOCAR's control in 2008. Since then, Petkim’s net profit has increased ninefold and the value of its shares soared by 8.7 times. At the meeting, SOCAR officials were informed that the construction work is very close to completion, with only 1% to go. The refinery will work in close cooperation with Petkim as a part of the same value chain. Production is forecast to commence in September 2018 and the capacity of the refinery is 10 million tons. Annually, it is expected to produce 4.8 million tons of diesel fuel, 1.6 million tons of aircraft fuel, 1.6 million tons of naphtha and other key products such as LNG, mixed xylene, HRON, oil coke and sulfur. A significant part of its products, mainly naphtha, will be used as raw materials by Petkim and support reducing overall costs. The production will be supplied mostly to the domestic market in Turkey with the remainder being exported. The project’s main target is the digitalization of the production processes this year. ''STAR Refinery will work closely with Petkim and supply this petrochemical complex within SOCAR with its essential raw - naphtha. STAR’s fuel products will be realized in the Turkish domestic market, which has a huge potential. 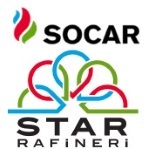 Thus, besides bringing additional revenue to Azerbaijan, STAR Refinery will also offer new jobs in the fraternal country, replacing part of the imports with domestic production'', said Rovnag Abdullayev, SOCAR President. SOCAR acquired a 51% controlling stake in Turkey’s Petkim petrochemical complex in 2008. The STAR Refinery aims to improve Petkim’s value chain. As an important part of the SOCAR’s new strategic development course, it will significantly contribute to the diversification of the company's processing and chemical assets. This year, SOCAR is planning to launch three facilities in the chemical industry: SOCAR Polymer and SOCAR Carbamide in Azerbaijan, which will be integrated with other local facilities, and STAR Refinery in Turkey integrated with the Petkim complex.